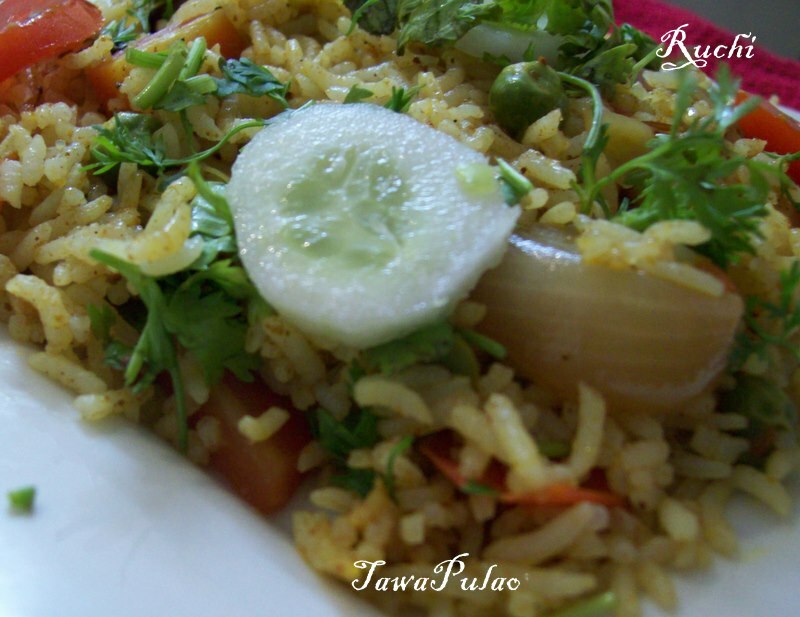 Tawa-pulao is my daughter’s favorite and a well-loved street food in Mumbai. Tawa Pulao is sold on Mumbai Streets in almost all corners, junctions or roads of Mumbai Just like Pav Bhaji people have craze to eat Tawa Pulao. It is made from rice and mixed vegetables and tossed with Indian spices &all stir-fried together on a large griddle-like pan called a Tawa, it is deliciouseasy and simple to make and Tastes fantastic and very satisfying meal. 1.Wash Basmati Rice and drain water completely. Keep aside for 10 to15 minutes. 2.Heat a tsp of ghee in a heavy bottom vessel & fry rice until fragrant then add 1½ to 1¾ cup water. 3.Add salt to taste. Cook rice in a pot or pressure cooker such that each grain is separate. Keep aside to cool. 4.Boil the vegetables in a Kadai till 3/4th done. Don’t overcook because we are going to let it to cook again. 5.Heat a nonstick Tawa or a heavy bottomed pan over medium heat. Add 2 tsp butter; let it melt down. Then add Cumin seeds and& bay leaves. 6.Add Onion and sauté. Once Onion is done, add Bell Pepper and Carrots. Sauté for 2-3 minutes. Do not overcook. 7.Add Cauliflower, Tomato. Stir well and let it cook for 1-2 minutes. Add Green Peas, Potato and Pavbhaji Masala. Add salt to taste, cook till oil separates. 8.In a large Pan/Tawa, add a tsp of Butter and add garam masala & Kitchen King Masala to it. Sauté for 10-15 seconds and mix it with the Tawa Bhaji. Then add the cooked rice and lemon juice mix well on a low Heat. 9.Garnish with chopped Cilantro and serve hot with Raita. new to me, looks inviting, will surely try. 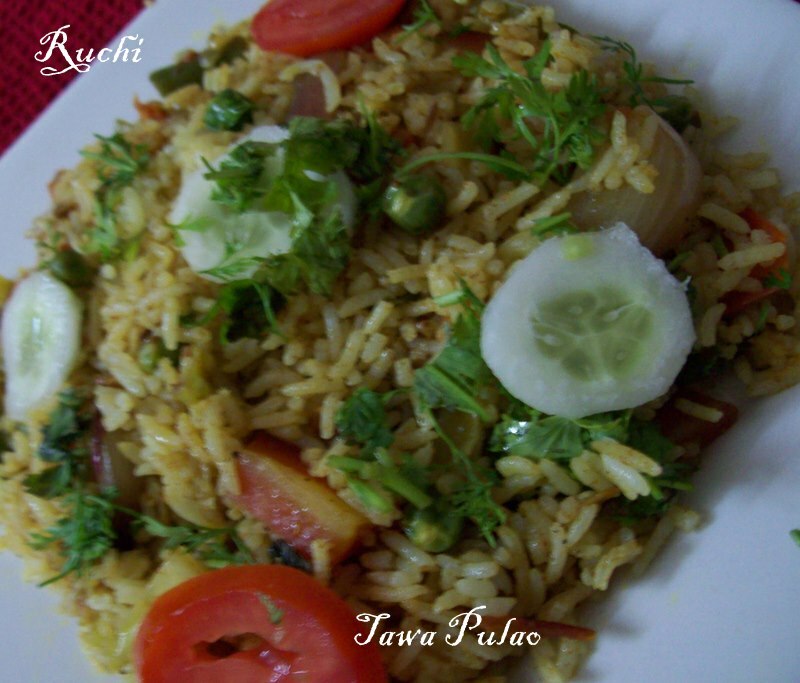 Fabulous looking tawa pulao...makes me hungry..
love this..I make this often..